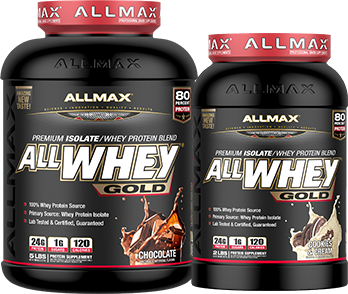 ALLWHEY® GOLD is an Ultra-Premium Whey Protein Isolate and Whey Protein Concentrate Blend with 24 g Protein in a 30 g serving; that’s an 80% yield! ALLWHEY delivers a clean, complete and whole protein that has been sourced from 100% whey protein with zero aminos added. Demand low carbs, low fat and low sugar. With unmatched Taste and Quality like this, you have to demand Ultra-Premium ALLWHEY® GOLD! New Premium ALLWHEY® GOLD is by far the BEST tasting ALLWHEY we’ve ever made! We tested over 50 versions and selected only the best, most amazing flavors. Using a completely NEW cutting- edge flavor technology our ALLWHEY flavors will make you think you just had a freshly-blended Ice Cream Milkshake. Easy to mix and even easier to drink, ALLWHEY fits your fit lifestyle!